Textiles can be made from a variety of materials. They are classified on the basis of their component fibers into silk, wool, linen, cotton, synthetic fibers like rayon, nylon and polyesters and some inorganic fibers such as cloth of gold, glass fiber and asbestos cloth. They are also classified as to their structure or weave, according to the manner in which warp and weft cross each other in the loom. 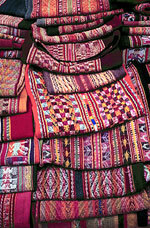 Textiles are obtained from a number of sources. They can either be obtained from animals, or are derived from plants and even vegetables. Bark Cloth: It has various uses and is used in sheets. Coir: It is a fiber obtained from coconuts. Cotton: It is a soft fiber that grows around the seeds of the cotton plant. Hemp: It is mostly used in rope making. Jute: It is produced from plants. Linen: It is made from flax. Nettle: It is processed in a similar manner to flax. Seaweed: It is a water soluble fiber. It is used as a holding fiber in the production of certain textiles.